I like to imagine that the Red Sox (yes, all of them) were reading my blog one day and noticed that while I talk and talk about my love of Boston, I have never mentioned the Red Sox. Yes, it turns out that it is entirely possible, because it's true. So the Sox took pity on us and invited us to join them as their guests for the July 2 game against the Padres. As soon as we walked onto the grass at Fenway my sons were overjoyed (visibly so!) 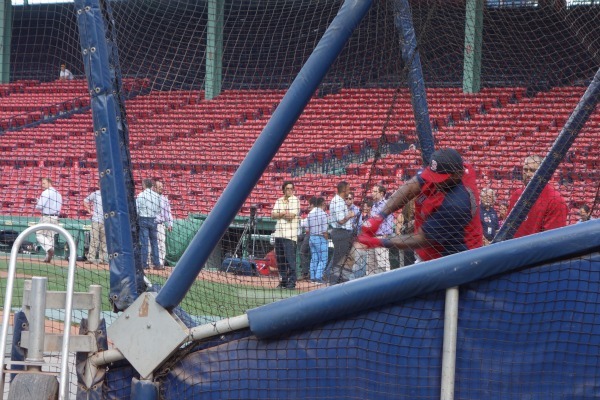 at the sight of none other than Dustin Pedroia. Yes! I mean, I couldn't believe how close he was. 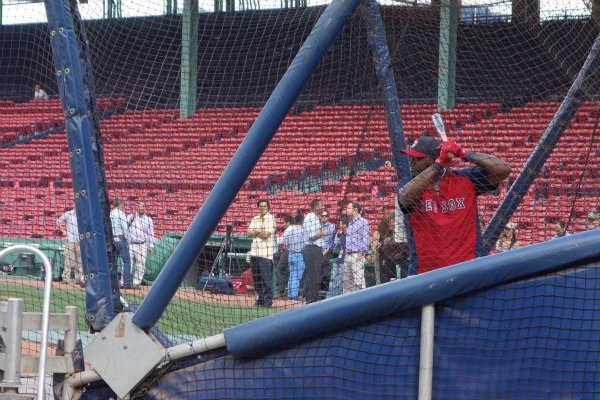 And sight of my boys being so close to the Red Sox who were just, you know, working and stuff? Priceless. I was so excited -- and so was my husband, who asked me to "say something 'Dominican'" to get his attention. That's the kind of thing that would upset me normally, because really, "say something Dominican", what? But I was too busy trying to think of something Dominican to say to get mad. 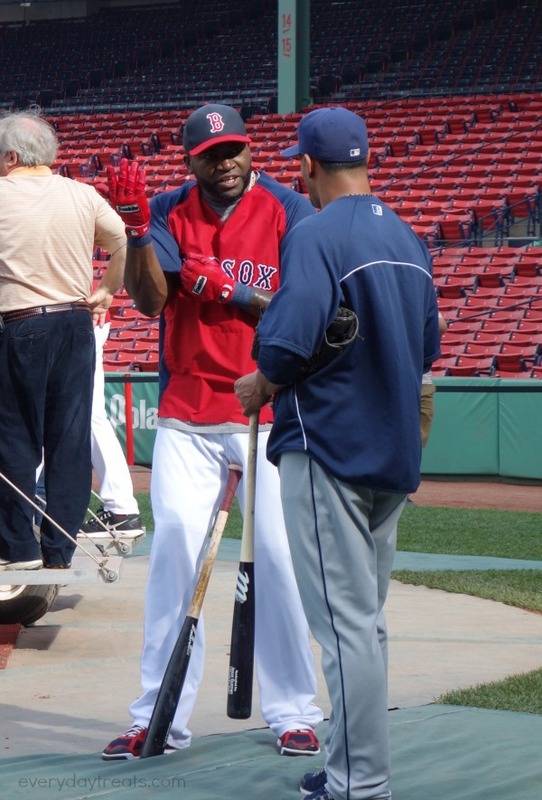 By the way, Big Papi is one friendly guy. Every player went over to chat with him (yes, even the Padres), and he had a smile, a high five, or a hug for everyone. And some got all three. Guy's the life of the party, for sure. Then, these guys came over and blocked our view by stretching in front of us. The nerve! I'm kidding, of course. Watching the Padres warm up mere inches away from me was not a hardship IN THE LEAST. Ahem. Dude. Even my kids were awwing. After practice we got a private tour of the park. I'd been before (*whispers* for a New Kids on the Block Concert, shhhh...) but the boys hadn't, and they got to see cool things like the first uniform and other memorabilia. So literal. I love it! I need to tell you guys about the people who work for the Sox and at Fenway. You know how Disney World has a reputation as the happiest place on earth? I think that Fenway park is ready to give Disney a run for their money. Every single person we met -- even the ones that didn't know we were there as guests of the Sox -- had a smile on their faces, offered to photograph us, and gave us little insider tips. For example, did you know that first-timers can go to the guest services desk for a special treat? And if you are one of the first five to sign up for that game, that your name will show up on the big screen? We didn't, and a random Ambassador told us when she saw that it was our kid's first time at the park. Speaking of sun and drink, we eventually we made our way to the Green Monster. I loved the Green Monster. It was the one spot I made my husband take silly touristy pictures of me. It's so fun to sit there on a bar stool, and have so many fly balls come right at you that you are constantly ducking. But, here's the thing: When you sit at the Monster, you better pay attention. My kids did, and started freaking out a bit. It's not the best place to sit if you have little ones. And don't park behind it, either. We watched a car's window get smashed -- it was across the street from Fenway. The kids had seen enough of the Monster. So we went down to our seats. 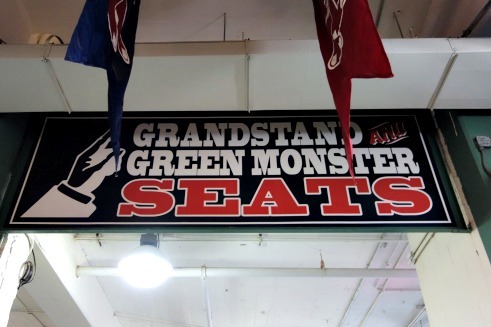 Our actual seats were in the grandstands -- they offered perfect protection against rain showers, plus the kids were afraid of the balls aiming right for them on top of the Monster. I still want to try the Monster someday -- just without kids! Oh, you're probably wondering about the game? It was fun -- and the Sox won, 4-1! Here's little bit of Sweet Caroline to top off a great night. The Sox earned two new little fans tonight (and cemented two older ones). 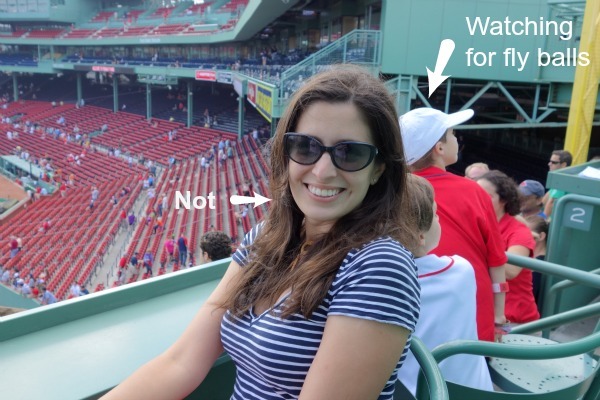 We were at Fenway as guests of the Red Sox, but anyone can experience everything we did. Tour information is here -- I highly recommend you check it out.